I knew them when they were just ordinary times, and they will be ordinary times again, if they have the time. They feel like heavy and hard times, because this kind of metamorphosis doesn’t happen organically. In these times, in which the unimaginable happens, and in which the unimaginable has to happen, because if you could imagine it, it wouldn’t happen; in these serious times, which laughed themselves to death at the thought that they could ever come to pass; surprising themselves by their tragedy, reaching out for amusement, catching themselves red-handed, striving for words; in these loud times, crashing with the terrible symphony of deeds which are reported, and reports which are guilty of inspiring deeds: the only words you can expect from me in these times are these, to prevent my silence from being misinterpreted. My respect for the irrevocable subordination of language in the face of the catastrophe is too profound. In the kingdom of lack of imagination, where man dies of spiritual starvation, without even feeling hungry, where quills are dipped in blood, and swords in ink, that which is not thought must be done, but that which is only thought cannot be expressed. Don’t expect me to say anything. I can’t think of anything new to say because it’s so loud here at my desk. Now is not the time to wonder whether it is the noise of animals, children or just gun shells. Whoever interprets deeds desecrates both words and deeds, and is doubly contemptible. The interpreters have not shut up, though. They have nothing to say because deeds are speaking for themselves, but they are still chattering. If you have something to say, step forward and shut up! I can’t use the old words any more, while new deeds are occurring whose observers say that they can’t be entrusted to them. My words used to be louder than a printing press, and just because they didn’t stop the press doesn’t mean that there was anything wrong with my words. Not even the biggest machines could prove that, and the ear which hears the trumpets of judgement day can still hear the daily horns. The filth of life didn’t freeze in shock, the printer’s ink didn’t turn pale at the sight of so much blood. The voracious jaws swallowed up all the swords, and we were transfixed by the jaws, seeing greatness only in the jaws themselves. And Gold for Iron fell from the altar in the operetta, throwing a bomb was just a rhyming couplet, and 15.000 prisoners were caught in a special edition, read by a soubrette, so a librettist was called. I have not had enough victims yet by a long way, I am insatiable. The line foreseen by fate has not yet been reached. It’s not really a proper war as far as I’m concerned, until only those who are unfit to serve are called up. Otherwise, my peace can’t relax, I secretly prepare for great times, and think things that I can say only to God, not to my country, which won’t even let me tell her that she’s tolerant to a fault, because if she’s even now not considering curtailing the freedom of the press, which doesn’t even notice the few blank spaces, she never will. And if I gave her the idea, she’d misundertand, and censor only my text. So I must wait, although I am the only Austrian who can’t wait, because I would rather see a simple auto-da-fé than the end of the world. What I am trying to say to those in positions of nominal power is just my obsession, but obsessions can save endangered things like countries and cultures. You don’t believe it when a general tells you how important swamps are, until one day you see Europe as just what surrounds the swamps. If I look at territory, I see only the swamps, and then only their surface and appearance, and only the contours of those. And sometimes I’m satisfied with just the sound of it, or a hallucination. Do me the favour, just for fun, of following me onto the surface of this problem-deep world, which was only created when it became civilized, which revolves around its own axis, and thinks the Sun should revolve around it. Above the noble proclamation, the poem that heralded this time of action, the only poem which it has yet produced, above the most humane proclamation which the street could show us, hangs the head of a music-hall comedian, bigger than life. But next to it, a rubber sole and heel manufacturer desecrates the mystery of the creation by claiming that a kicking baby should be born with his product, and no other. If I think that people should rather not be born at all in the current state of affairs, I’m strange. If, on the other hand, I maintain that in the current state of affairs people won’t be born at all, and that maybe replacement soles and heels will be born, but not the people to wear them, because they couldn’t keep up with their own development, and got left behind as the last obstacle to progress; if I suggest something like that, I’m an idiot, drawing general conclusions from one symptom, deducing the plague from a boil. If I weren’t an idiot, but rather an educated man, I would draw such bold conclusions from the germ, not from the boil, and people would believe me. It would be stupid to say that we ought to confiscate the boil to cure the plague, but I am convinced that the root of these times lies on the surface. Whatever we want to call them, and however we judge them, whether they are still falling apart, or are already the dawn of something new, whether they show the blood on Hamlet’s hands or are preparing for Fortinbras. Such things are revealed by confusion; what used to be a paradox is revealed by great times. 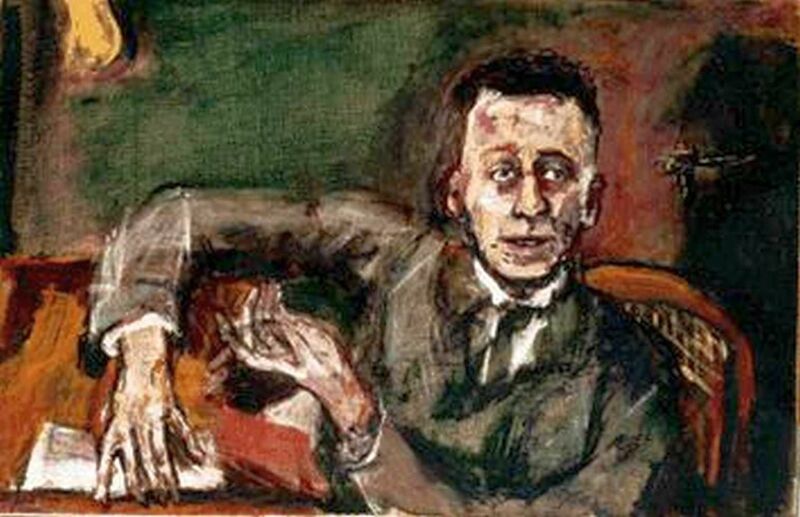 As I am neither a politician nor his step-brother, an aesthete, I wouldn’t think of denying the necessity of anything that happens, or to complain that humanity doesn’t even know how to die beautifully. I’m sure it is right to fire on cathedrals if they are being used by others as military positions. No problem, says Hamlet, but then a gaping abyss opens up below the question, „When can we expect the even greater war: the war of the cathedrals against mankind?” I know that it’s sometimes necessary to turn markets into battlefields, so that they turn back into markets, but some gloomy day you can see more clearly, and you ask yourself whether it’s really the right thing to do, to follow the path which leads away from God so faithfully, not missing a step. And whether the eternal mystery which produces mankind, and to which he returns, is really just a commercial secret which gives some men superiority over others, and even over the Creator. The man who strives to extend his possessions and he who only wants to hang on to what he’s got, are both labouring under their possessions, not making use of them. The one declares them, the other justifies them. Don’t we fear something greater than loss of possessions, when human sacrifice is scandalously accepted and suffered, and behind the language of moral rearmament, as the intoxicating music fades, between earthly and celestial hosts, one pale morning, we hear the affirmation, „From now on, travelling salesmen will keep their antennae extended permanently, and frisk the customers all the time”? People are just customers. Behind flags and flames, heroes and helpers, behind all fatherlands, there is an altar at which pious science rings its hands: God made the customer! But God didn’t make the customer for him to be happy in this world, he made him for a higher purpose: so that the shopkeepers are happy in this world, because the customer was born naked and only becomes a shopkeeper when he sells clothes. You cannot philosophically challenge the need to eat to stay alive, and doing so publicly shows an insuperable lack of shame. Culture is the unspoken agreement to make food subordinate to the reason for living. Civilization is the subordination of the reason for living under food. This ideal serves progress, and progress provides the weapons of this ideal. Progress lives to eat, it sometimes even demonstrates that it can die to eat. It bears adversity to stay healthy. It subjects premisses to pathos. The ultimate acceptance of progress has required for a long time that needs are determined by supply, that we eat to satisfy the hunger of others, and that advertisers interrupt our thoughts to offer us things we don’t need. Progress, under whose feet the grass mourns, and the woods turn to paper, out of which the leaves grow, has subordinated the meaning of life to the production of food, and reduced us to being just the adjusting screws of our tools. The march of time is lame; because when it was healthy it encountered the man who lives from selling crutches. Where no effort has been spared to make life smooth, there is nothing rough left. Individuality can survive there, but it cannot flourish. It can pause nervously, surrounded by faceless automatons who come and go easily, without greeting. As the judge of natural values, it would choose differently. Certainly not the current mediocrity which saves its mental activity for the propaganda for its merchandise, which has given in to a romantic of foodstuffs and has put art at the service of the shopkeepers. The choice is between spiritual power and horsepower. No race comes home from work to itself not weakened, or only for entertainment. The tyranny of the necessity of life allows its slaves three freedoms: opinion, the freedom of the intellect, entertainment, the freedom of art, and debauchery, the freedom of love. There are, thank God, some goods which remain hidden when goods are always supposed to circulate, because in the final analysis, civilization lives from culture. When the terrible voice which is allowed to drown out commands these days, calls upon the travelling salesmen, in its fantastically intrusive language, to put out their feelers, and frisk the customers, in the gun smoke; when it convinces the outrageous to heroically reclaim the battlefields for the hyenas, it has a trace of the bleak sincerity with which the zeitgeist grins at its martyrs. We sacrifice ourselves for ready-made goods, we consume, and live so that the means consume the end. We are lucky if a torpedo spares us; it’s more acceptable to criticize God than a torpedo! And the unavoidable necessities which a world lost in the labyrinth of the economy has set itself, demand their martyrs. And the hideous editorial writer of the passions, the registered jewboy, the man at the cash desk of world history, tots up victories and keeps daily balance of the turnover in blood, and screams his greed for profit in copulations and headlines, and enters the dead, wounded and captured as assets, sometimes confusing mine and thine, dregs and legs, but taking the liberty, gently emphasizing his modesty, and perhaps in consultation with the impressions of informed circles, and without abandoning imagination, of distinguishing strategically between laymen’s questions and answers. And when he then dares to welcome the gratifying upsurge in heroic emotions, and congratulate the army and its „brave soldiers” in terms of their efficacity, and to encourage it like at the end of a satisfactory day at the stock exchange, there seems to be only one voice who gets upset about it, just one which says so today, but what can you do? As long as there is the one voice, whose echo doesn’t need to be any more than a storm of the elements rising up against the spectacle of an age has the effrontery to call itself great, and doesn’t set such a pioneer an ultimatum! The surface sits and sticks to the root. The subjugation of mankind under the economy has left it only the freedom of enmity, and if progress sharpened its weapons, it also created the most murderous of all, one which took from it the last worry about its earthly salvation, beyond holy necessity: the press. Progress, which also controls logic, responds that the press is no different from a professional association, which lives from an existing need. But if this is both true and correct, and if the press is really nothing more than a reflection of real life, that’s enough for me because that tells me how this life is. And then, one fine day, I realize that life is only a refection of the press. 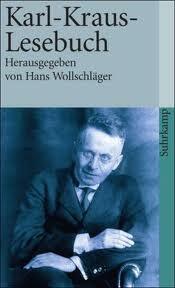 If I had got into the habit of underestimating life during the days of progress, I must overestimate the press. What is it? Just a messenger? Someone who also annoys us with its opinions? Torments us with its sensations? Which delivers the interpretation with the information? And tortures us to our limit with details of particularities about sensations, or perceptions about observations, particularities of details, in constant repetition? Are the hord of outstandingly well-informed, educated insiders, who are supposed to confirm it and declare it to be correct, important parasites of the superfluous? Is the press a messenger? No, the event. A speech? No, life. It doesn’t just claim that its reports of events are the events themselves, it achieves that disquieting identity which makes it seem as though things are reported before they happen, and that war reporters are not allowed to be witnesses, but warriors can become war reporters. In this sense I am happy to be accused of having overestimated the press all my life. The press is not a servant, how could a servant demand, and get, so much? It is the event. A tool has become our master again. We have put the people who were only supposed to report the outbreak of a fire, probably the most subordinate role in society, in charge of the world, above the fire, the house, the facts, and our imagination. But like Cleopatra, we should, in our curiosity and disappointment punish the messenger for the message. She makes the man who reports a marriage of which she disapproves, and embellishes the message, responsible for the marriage. „Speak good tidings to my ear, which has not received any such for so long. . . the most poisonous of all plagues, I tell you! What do you say? Get out of my sight, you miserable scoundrel, or I’ll tear your eyes out, pull your hair, tie you up in ropes, and cook you in brine.” (She hits him.) „Dear Lady, I just told you about the marriage, I didn’t contract it.” But the reporter contracts the marriage, sets fire to the house, and makes the atrocity that he invented come true. By decades of flattery, he has thrown mankind into the crisis of imagination which makes a war of self-destruction possible. He has planted the blind valour which is needed to rush in regardless, because the boundless immediacy of its apparatus has made the ability to experience and extrapolate mentally, superfluous. He can bask in the reflected glory of heroic virtues, and his abused language beautifies an abused life, as though eternity had saved up its apogee just for this age in which the reporter is living. Do people understand which life the newspaper expresses? One which has long been just the expression of itself! Do we realize how much exterminated spirit, stolen nobility and desecrated sanctity the last half-century owes to this unleashed intellect? Do we know how much of the goods of life the Sunday belly of such a rotating beast has had to swallow before it could appear as an edition of 250 pages? Are we aware how much systematic effort has to be made, by telegraph, on the telephone, photographically, to get a society, which admittedly already had the potential, into that state of broad amazement about the tiny fact which, in the repulsive cliché language of these messengers, is referred to as,„groups forming” or a ,,crowd gathering”? As modern life is only about quantity, which no longer needs to be measured because it has always already been achieved, so that in the end it’ll have nothing left to do but to devour itself; as the self-evident record leaves no room for doubt, and saves us the painful exactitude of continuing to calculate the consequence, we are so exhausted by the variety and multiplicity, that we cease to care about the result. And in a time in which we are presented with the detailed impressions of the first impressions of all occurrences, twice a day with twenty repetitions, the great quantity dissolves into individual fates, which are only felt by the individuals, and suddenly, even at the very top, the yearned-for hero’s death seems suddenly to be a terrible fate. People could come to realize what a small matter such a world war is compared to the spiritual self-mutilation of humanity by its press, and how the war itself was basically only one of the effects of this self-mutilation A few decades ago, Bismarck, who also overestimated the press, said, “That which the Germans have won by the sword, is being ruined by the press”, and blamed it for three wars. Today, the relationship between catastrophes and the press room are deeper, and therefore less clear, because in the age of those who act, actions speaks louder than words, but the sound of the action is louder still. We live by the sound, and in this upside down world, the echo is the father of the call. In the acoustic economy, weakness can go through amazing changes. The state can use it, but that’s no good to the rest of the world. Bismarck realized this, when progress was still a baby, and not sneaking through the culture in crepe-soled shoes. 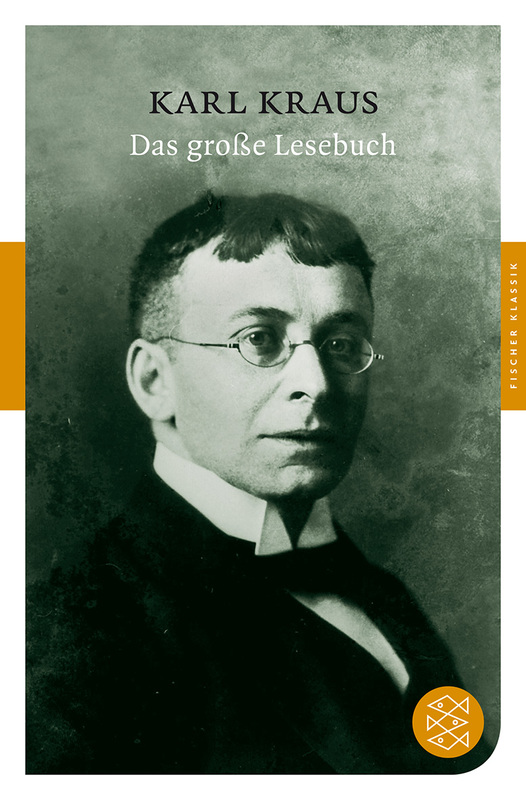 He said, “Every country will sooner or later be held responsible for the windows that its press breaks.” And he added, “The Viennese press is even worse than I had imagined, even worse and more damaging than the Prussian.” He accused correspondents of either making it up, or peddling the official line, to avoid being accused of not being well-connected. We are all completely dependent on the interests of this one trade. If you only read the papers for information, you won’t get the truth, not even the truth about the newspapers. The truth is that the papers are not a source of content, they are the contents themselves, or even more than that, they are the source. They provoke atrocities by condemning them. There is more injustice in the world because of the existence of a press which made up the injustice which it condemns! It’s not countries fighting each other, it’s the international disgrace, the profession which rules the world, not despite its irresponsibility, but because of it, it inflicts wounds, tortures prisoners, stirs up hatred for foreigners, turns gentlemen into hooligans. It can turn printer’s ink directly into blood just by virtue of having no principles, and bad intentions. A last unholy miracle of the age! At first it was all lies, always including the lie that only the others lie, and now, thrown into the hysteria of hate, it’s all true. There are different nations, but there’s only one press. Dispatches are weapons just like shells, they make just as little allowance for the situation. You think, but the others know better, and its you that gets hurt. The specialists of lack of consideration are people with whom no soldier would be prepared to share a trench, but they have to put up with being interviewed there. They break into recently abandoned royal palaces for the right to say, “We were the first ones there!” To be paid for carrying out atrocities would not be nearly as shameful as to be paid for making them up. Bravehearts in a metaphorical sphere of influence, who sit at home, if they do not have the good fortune to be telling stories in a press centre, or make it to the front, they tell their readers tales of horror every day, until they have every right to actually feel it. Everybody gets a share of the quantity which is the essence of the age, to deal with emotionally, and the shared part is described so vividly by transmission and in the cinema that we go home happy. Once, however, the reporter has destroyed our imagination with his truth, he threatens our life with his lies. His imagination is the most terrible substitute for the one we used to have, because when one side claims that the other has murdered women and children, both sides believe it, and proceed to do so. Don’t you yet feel that an unprincipled word, which may be acceptable in principled times, carries further than an explosive shell, and that the moral fabric of these times will let us down when it gets serious? If the nations were only wise enough to introduce universal conscription, but forbid telegrams, a world war would be milder. If they had the courage, before such a war broke out, to drive the journalists into an internationally agreed knacker’s yard, who knows, we may even be spared the war! But before journalists and the diplomats whom they manipulate, disarm, mankind has to pay for it. Bismarck also said that some things are still true, even though it says so in the papers. There are also other things in the inside pages, where upright feature writers compose battle prayers for a fee, kiss their allies on the lips, praise the glorious tumult of our days, admire the organization, just as they used to admire scruffiness, compare a fortress with a beautiful woman or vice versa, it just depends, and live up to the greatness of the times. One of them, a foreigner, serialized his account of his experiences in a capital city which he had to leave, under the title “Terrible Days”. 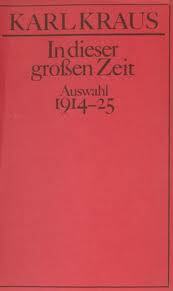 The worst things that happened to him were that he was asked to leave, and that he was only offered 1200 Francs in exchange for 1000 Marks, and, above all apparently, that the taxis had no meters, which is actually not unusual at traffic junctions just before general mobilization. Apart from that, it’s hardly credible, he couldn’t speak highly enough of the calmness, consideration, even compassion, of the local populace, of whom we had been told by telegram that they had behaved themselves like panthers and wolves who had escaped from a menagerie damaged in a railway accident, that is to say that conditions were such there, before the war, as after a concert elsewhere. Telegrams are weapons. You can never be sure with feature articles, the truth can always slip through, but even if it does, it’s probably not true any more, because telegrams have been sent in the meantime and corrected reality by becoming true. Or do you really think that Nordau painted everything in a favourable light because he wanted to make room for the return of peace? No, journalism has the power over life and death, depending on whether it is just pursuing its own advantage or also trying to put others down. In general, it’s fair to say that in times of war, as well as the solid work done by weapons, a considerable amount is achieved by words and chance. Atrocities committed by the population of enemy states come from either vulgar, or very vulgar, that is to say educated, origins. The mob and the press are above national interests. The one loots, the other sends telegrams. And when the one sends telegrams, the other feels justified, and what editors have decided, nations pay for, and avenge. Reprisals are the response to the press. It exaggerates the condition of the world which it has created. Even if it were only an expression, the condition would be bad enough. But it is an instigator. In Austria, it has made up, and kept going, the sterile pastime of nationality conflicts, so that it could pursue the interests of its shameful intellect unnoticed. When it has achieved what it wanted, it pays for future profits in kind, with its patriotism; it buys falling values, it is a phoenix that emerges gorgeously from other people’s ashes. Let’s say, for the sake of argument, that I overestimate the press! But if I am wrong to say that in a time which is so easily inclined to think that the extra edition is the event itself, and which lets itself be misled with inflamed nerves from lies to facts: if it is not true that more blood has flown out of telegrams than they contained, then let this blood flow over me! “Let this be the last time,” cried Bismarck, “that the gains achieved by the Prussian sword be thrown away so carelessly, to satisfy the insatiable demands of a phantom, which, under the false name of zeitgeist or public opinion, tranquilizes the wisdom of princes and peoples with its clamour, until everyone is afraid of the shadow of everybody else, and everyone forgets that the lion’s mane of the ghost conceals someone who may be noisy, but is not really that frightening.” He said that in 1849. Hasn’t this harmlessness grown up in the intervening sixty-five years! That it isn’t lost for words in the face of deeds which it incited, shows for whom it meant them to be done. The machine has declared war on God, and while still doing the things which I always thought it could do, still finds words, and the age measures them and is amazed how big it has become overnight. It probably always was, I just didn’t notice, so it was an error of my perspective to think that it was small. All the same, resolving surface grievances, which hide greater ones, is too small a challenge for me, I’m not up to it. Someone asked recently where I have got to, and asked me, in view of the new times, to free us of the old dirt. I can’t. Surely, great, elemental things must have the strength to deal with grievances on their own, without needing the ideas and help of a writer. But this great, elemental thing, which already loomed large before all eyes, has still not managed it. What do we see? Greatness has side-effects. If the consequences are as great as it, God help us! Greatness has not dealt with the side-effects overnight. That bombs are launched by jokes, and clip joints present a 42 cm howitzer program, shows us both how conservative and at the same time how up-to-date we are. It’s not the event, but the anaesthesia, which it makes possible to bear it, which explains it. We know how our in-born humour comes to terms with the surfeit of blood. But the intellect? How do our poets and thinkers deal with it? Even when the world stands on its head, they have no answer! And even if the world tears itself apart, no intellect emerges! It won’t emerge later either, because it should have expressed itself now, secretively, in silent dignity. But all around us in our cultural environment, we see nothing but the spectacle of the intellect hanging on to buzz-words, when the character is not strong enough to keep its peace. The voluntary war service of the poets is their way into journalism. Messrs Hauptmann, Dehmel and Hofmannsthal certainly have the first claim to a medal. The other unleashed dilettantes struggle in their wake. Never has banality been embraced with such enthusiasm, and the sacrifice of the leading intellects is so quick that one is inclined to suspect that they never had an identity to sacrifice in the first place, but that they were driven rather by the heroic idea of retreating to where it is safest, into empty phrases. It’s just sad that literature doesn’t feel its intrusiveness, and the superiority of the citizen, who finds the experience he deserves, in the phrase. To try to rhyme a foreign, but real, enthusiasm, badly, to match greet with fleet, and affirm that gangs go out and hang their victims, is the very least that society can expect from its intellectuals in urgent times. The inarticulate noise that reached us from enemy poets, is at least evidence of the individually felt arousement which reduces the artist to a nationally defined private individual. In any case, it was at least the poem which allowed the poets to mix up the facts. The accusations of barbarity in the war were false information, but the barbarity in times of peace, which is ready to rhyme when things get serious, and which writes leading articles about foreign events, is an indelible disgrace. And in the final analysis, Hodler, who was wrong, doesn’t come out of it any worse than a dozen Haeckels, who were right. And in the same final analysis, a fit of rage has more culture than an official inquiry which is lenient enough to answer the question whether it should be allowed to present Shakespeare, in the affirmative. Germany’s greatest recent poet, Detlev von Liliencron, a war poet, and victim of the cultural results of victories, probably wouldn’t have had the heart to hang his opinion onto the still-smoking facts, and we will have to see whether, from among those who have experienced this war, and those with a poetic sensibility, one will emerge who can integrate the material and words into art. We will find out whether life can still grow out of quantity, to which there is no longer any bridge from emotional life, because it was torn down. Intellects who hide swiftly and comfortably in the crevices of their selves when danger threatens, can be fed to the pigs. Perhaps even the smallest war always purifies the surface, and has profound effects. What are the consequences of this greatness, which is made great by those forces against which the greatest war should be fought? Is it a redemption, or just the end? Or just a continuation? I hope that the consequences of this huge affair are not worse than its side-effects, which it wasn’t strong enough to overcome. Let the void not become bigger than before, appealing to burdens endured, that idleness becomes glorious, that smallness appeals to the world-historical context, and the hand which picks our pockets shows us its scars first! How was it possible that a world-renowned newspaper was able to make a celebration of the world war? That a stock exchange burglar was able to demand, and receive recognition, among ecstatic shares, for the fiftieth anniversary of his wicked trade, before the battle of the millions? That banks were not able to service their customers during the moratorium, but paid him more than four hundred crowns each for the hundred adverts in his jubilee edition? That the homage of the newspaper boys could be heard in the thunder of the guns, and the list of those offering congratulations marched through the papers for weeks, like a list of the losses of culture? How was it possible that in the days in which the empty phrases were already beginning to bloom, and sacrificed their last life to death, they were still able to be window decoration in a free thinkers’ whorehouse? That writers wave aloft flags that have been in the field, and that a cultural book-keeper and privateer is feted by a host of high-ranking servants as “Chief of the General Staff of the Intellect?” May the times become so great that they do not become the booty of a victor who pursues intellect for commerce, that they overcome the nightmare of opportunity, in which victory becomes the spoils of non-participants, the perverse chase after medals relinquishes its honour, abandons the affectation of using foreign words and menus, and slaves whose lifelong ambition it was to master languages decide to get through life by not mastering languages! What do you participants in the war understand of war? You’re just fighting! You didn’t stay at home! Even those who have sacrificed their ideals for life can still sacrifice their lives. May the times become so great that they are worth this sacrifice, but not so great that their memory makes them part of life! 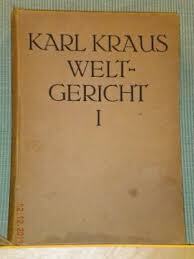 Notes: This text was Kraus’ first reaction to the outbreak of the First World War, after remaining silent for some months. 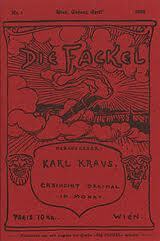 This entry was posted in 1914, Die Fackel, Karl Kraus. Bookmark the permalink.